I will be thinking about IQ2 today, but I doubt I’ll be working on it much as we are driving out of Mexico to catch a flight in Arizona tomorrow. And you can’t “think” a novel into being. Up at 5, all packed, drinking coffee, waiting for Marie, her sister Marcia, niece Anna, and their dog Zoe, who got spayed down here yesterday and I suspect will be the most relaxed of the bunch because of the residual drugs still in her system. Were hoping to get to Scottsdale early this afternoon, trying to determine which border crossing will be the fastest. Morning border crossings into the US usually get backed up. We arrived in Scottsdale, then Marie and I tried to put about 300 pounds of stuff into 4 bags and have them weigh 50 pounds each. I don’t want to bore you with the details of this mathematical impossibility, but we solved the problem. 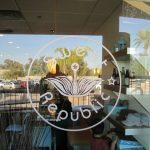 To reward ourselves we went to “Sweet Republic” here in Scottsdale whose ice cream was voted the best in the United States by Bon Appetit Magazine.